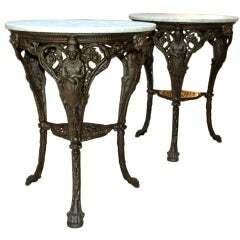 Marble is good condition, no chips or cracks Table Height without marble is 27.75 inches Table diameter without marble is 18.25 There is little old paint left on one of the iron rosettes, pls see image 12, 16 and 17. 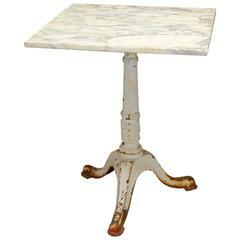 Set of two sunshine yellow garden tables with profiled marble top. Pair of French Art Deco burl wood bedroom commodes, circa 1930. 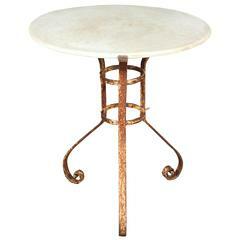 Each table has 3 drawers with original brass hardware. 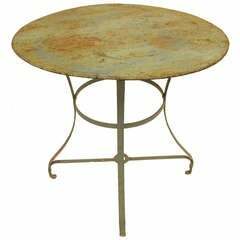 Metal garden or bistro table with beautifully aged and weathered turquoise paint, France. Early to mid-20th century.